A man has died and seven others of his family members were injured after a fire swept through a residential building near Helal Market in Uttarkhan area of Dhaka early today. The fire originated from a leak in the gas line around 4.00am on the ground floor of the three-storey building at Uttar khan’s Baperipara area, said Shafiqul Islam, senior station officer of Uttara Fire Service. Eight victims were taken to Dhaka Medical College Hospital’s Burn Unit, where one of them died while undergoing treatment around 10:30 am on Saturday. The man has been identified as 27-year-old Md Azizul, said Md Bachchu Mia, sub-inspector of DMCH police outpost. Ninety-nine percent of Azizul’s body was burned in the fire. 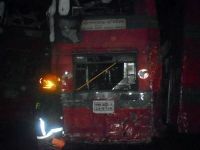 The deceased has been identified as Azizul, 28, while the injured are Sufia, 50, Purnima, 35, Dablu, 33, Anju, 25, Muslima, 20, Sagar, 12, and Abdullah, 5. On information, three units of firefighters rushed to the spot, rescued eight of the family members and sent them to Dhaka Medical College Hospital, Bachchu Mia, in-charge of the hospital’s police outpost unit, told the media. 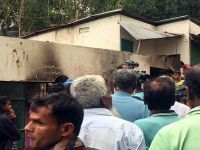 According to the sources at DMCH, Dablu suffered 65 percent burn injuries, Anju, 6 percent, Abdullah 12 percent, Muslima 98 percent, Purnima 80 percent, Sufia 99 percent and Sagar 63 percent. The victims came are all relatives. Some of them work as rickshaw pullers or in the readymade garment industry. The fire started when a stove was lit in the early hours of the morning, fire service official Shafiqul told the media, citing the victims.